Your Charlotte Nanny Agency – Nanny & Domestic Placements & Careers in Charlotte and Across The Carolinas! Welcome to Charlotte’s Best Nanny Agency where we take pride in providing the most custom nanny placements with expert care in the Charlotte Metro Area. Charlotte’s Best Nanny Agency is conveniently located in the heart of Charlotte’s Dilworth neighborhood, and provides Nanny and Domestic placements throughout the Carolinas. Our Charlotte nanny agency is dedicated to matching and placing our Nannies and Domestic Staff with the unique needs of each family in mind. We provide each family with a custom nanny placement experience. Every Nanny, Babysitter, House Manager, or Domestic Staff Candidate is handpicked to meet the specific needs our families. Charlotte’s Best Nanny Agency is the only nanny agency operated by a Charlotte Native and Domestic Placement Specialist. We take the time to understand the needs of each Nanny and Family that we work with. We provide nanny referrals for nannies and domestic staff that are highly qualified to provide expert care for your children and whole family. We Provide Expert Nanny Matchmaking: Live-In Nannies and Live Out – Full-Time Nannies, Part-Time Nannies, Temporary Nannies, Back-Up Nannies, Summer Nannies, and Babysitters. As well as House Managers, Estate Managers, Personal Assistants, and all other Domestic Staffing in the Carolinas. All nannies are ready and willing to help you with all your childcare needs and provide a nourishing and educational environment. We have an extensive nanny database of nannies that have experience working with children of all ages, multiples, children with allergies, mental or physical handicaps, learning challenges, divorce, death of a family member, and many other unique situations. All of our nannies are fully screened in person by a trained Placement Specialist, and extensively and fully background checked before they come to work for you. Our nannies are college educated, CPR certified, and have glowing references. Charlotte’s Best Nanny Agency also places professional, reliable, and trustworthy household managers, estate managers, and personal assistants. Our college-educated professionals provide expert service for managing your home and personal needs. We are your go-to Charlotte Nanny Agency, for all of your custom childcare and household staffing needs. We look forward to providing the absolute best nanny possible for you and your family very soon. -First Aid Trained and some even have obtained advanced medical licensing such as: CNA’s, RN’s, EMT’s, and even retired MD’s. 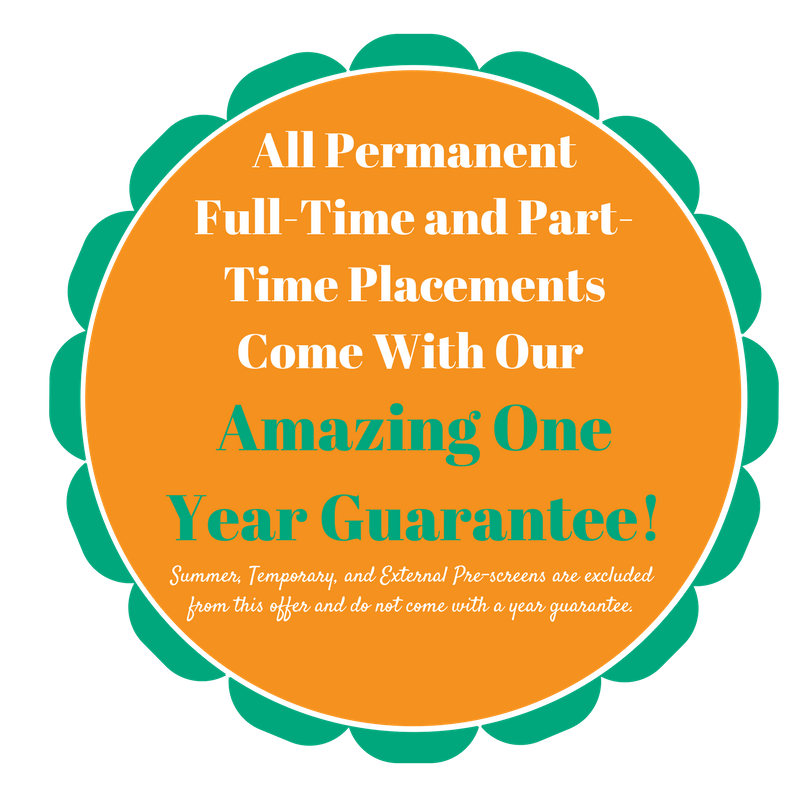 Charlotte’s Best Nanny Agency has a One Year Guarantee. If you are unhappy with your nanny (within the first 12 months) we will do one replacement search FREE of charge for a new nanny of your choice! Charlotte’s Best Nanny Agency is the winner of the Charlotte Parent Magazine Readers’ Favorites Award as the favorite Babysitting/Nanny Service in 2017 and 2018. Macaroni Kid South Charlotte 2013, 2015, 2016, 2017, and 2018 Golden Daisy Award winner for “Best Child Care Resource” In Charlotte. Charlotte’s Best Nanny Agency is one of two APNA (Associations of Premier Nanny Agencies – A Household Staffing Alliance) affiliated nanny agencies in North Carolina. As well as the only Charlotte nanny agency that is a member of the APNA. In addition to APNA, we are also members of the INA (International Nanny Association). We are proud to be members of the INA and be part of a group of wonderful agencies and nannies in the U.S. In addition, we are members of the DEMA: Domestic Estate Managers Association. Community: We are committed and dedicated to not only provide the best nannies and care for your family, but care for our our local Charlotte community too. Please visit our causes page to learn more about organizations that we have supported. If you would like us to support your cause, please contact us! Charlotte Nanny and Domestic Placements – Trusted Nanny and Domestic Placements in the Carolinas – North Carolina, South Carolina, & beyond: We are here to find you the best nanny placement solutions.